The Ride is a musical collaboration between Andre Leo, Lucas Swart and Lucy Kruger, showcasing songs from all their various projects. They will be performing live at KAMERS 2013 Bloemfontein, 3-6 October, and Stellenbosch, 5-10 November. Lucas and Andre released their first album with The Pretty Blue Guns in 2007, with two more in 2009 and 2011. Lucy released her debut solo album, Cut Those Strings, in 2012, with another in the works. 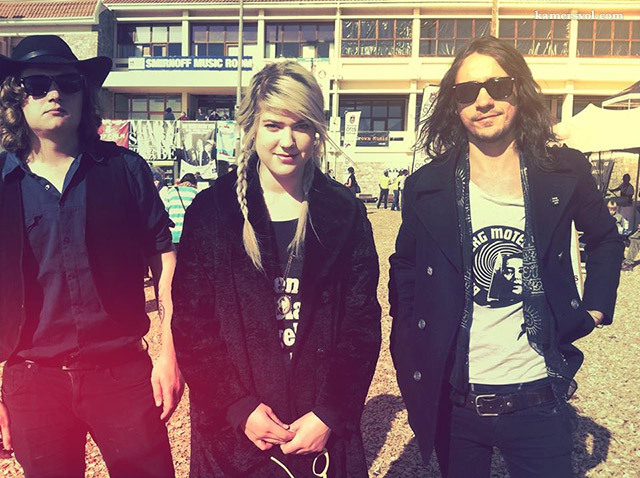 The trio plays together in the Cape Town Psychedelic rock n roll band, The Very Wicked. Their set consists of original material by each member, as well as covers ranging from the Velvet Underground to Tom Waits to Gillian Welch. Enjoy these few video previews and come listen at the shows! While away in the Karoo to write new material, Andre and Lucy play Sweet Come Down by The Black Ryder to get into the swing of things. One take video of Lucy and Andre performing Shudder live and unplugged in the Karoo, the night after she rolled her car. Live iPhone footage of Lucy performing a song written on tour in Jo’burg. Lucas Swart (on guitar) and Scott Fuller (on drums). This video follows The Ride’s journey of music, friendship and the open road. Tags: Andre Leo, Bloemfontein, Cut Those Strings, KAMERS 2013, Lucas Swart, Lucy Kruger, music, Stellenbosch, The Pretty Blue Guns, The Ride, The Very Wicked, Webersburg. Bookmark the permalink. We love your music, where can we buy an album?